The United Nations flag above part of the UN Common Compound, used by UN humanitarian agencies and their partners, in Mogadishu, Somalia in December 2011. Top United Nations officials have voiced their outrage at today’s deadly attack on the world body’s compound in the Somali capital, Mogadishu, while reiterating that it will not deter the Organization from helping the country as it proceeds on the path to stability and development. According to the UN Assistance Mission in Somalia (UNSOM), a pickup truck rigged with explosives was detonated outside the gate of the UN Common Compound – in which UN humanitarian and development workers reside and work – around 11:30 in the morning, and attackers then entered on foot. Gunfire and further explosions followed, as staff took refuge in secure areas. The UN confirmed that, among those killed are one international staff member, three contractors and four Somali security guards. 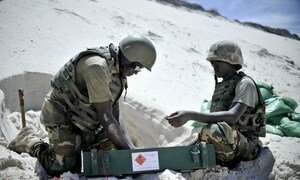 A number of Somali civilians were also wounded and killed outside the compound. “The Secretary-General is deeply saddened by the loss of life in the UN family, its contractors and among Somalis,” said a statement issued by Ban Ki-moon’s spokesperson in New York. “Malicious terrorist attacks of this nature will not deter the United Nations or weaken its resolve to stand by the people and Government of Somalia as they work courageously to build peace in their country,” it added. Mr. Ban, who is on an official visit to China and spoke by telephone with Somalia’s President, Hassan Sheikh Mohamud, said he was outraged by the “despicable” attack and urged the President to ensure that UN staff are protected. Both the Secretary-General and his Special Representative for Somalia, Nicholas Kay, expressed their gratitude to the Somali Government and the African Union Mission in Somalia (AMISOM) for their immediate responses to secure the area and protect UN personnel. “I am truly shocked and horrified by what took place in Mogadishu today,” Mr. Kay, who heads UNSOM, said in a statement issued to the press. Mr. Kay noted that the vast majority of UN staff are unhurt. “Our Mogadishu colleagues are shaken but the United Nations remains determined to stand by the people of Somalia,” he said. Deputy Secretary-General Jan Eliasson, in remarks at a Security Council debate in New York, voiced solidarity with the UN staff and all those who have suffered through this tragedy. “We remain committed to the principles of achieving peace and to keep Somalia on its path to recovery,” he stated. The 15-member Council, in its own statement to the press, voiced its outrage at the attack, for which the Islamic militant group known as Al-Shabaab has claimed responsibility. Council members underlined their support for all UN personnel working to bring peace, stability and prosperity to the Somali people. Following two decades of strife and humanitarian crises, Somalia entered a new phase in its history last year with the establishment of a representative Government and the approval of a draft constitution. UNSOM, a political mission supported by the Department of Field Support (DFS), began operations earlier this month. It is tasked by the UN Security Council to offer expertise in areas ranging from the political process to disarmament to help the country consolidate and build on hard-won gains towards peace, reconciliation and stability. From the Horn of Africa in the east and across the Sahel to the west, terrorism continues to pose a threat to the continent’s peace, security and development, Secretary-General Ban Ki-moon said today as he warned that Africa was facing a rise in the presence of extremist groups and terrorist entities.